Rob in his motorcycle vest. 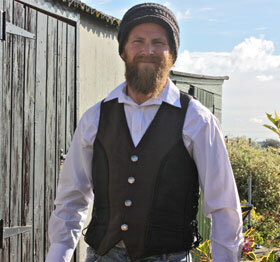 I ordered a waist coat from you last September, after trying to find a good quality, slightly different to the norm that you find at all the bike rallys in the U.K. I was saddened to not be able to find anything I fancied. 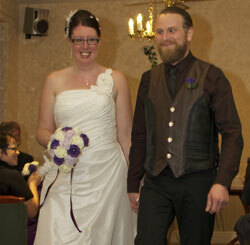 After stumbling upon your website I was impressed by the look and style of your waistcoats and I knew I had found the one for my wedding, of which my wife to be would approve. From the moment of enquiring and speedy response to the shipping costs, import tax. I was put at ease that I was dealing with a professional company that I trusted handing over my hard earn cash. After placing my order it was soon dispatched with a tracking number so I could follow its travels to the UK. I recall it only had taken around 3 days to arrive at UK Customs, after paying the import tax, it arrived within 7 days of ordering. As soon as I tried it on, it fit like a glove. I now have been wearing the waist coat since early December and it seems to go with a smart look wearing a shirt or casual at a bike rally. Its quality is fantastic with a nice heavy, comfort weight to it, its a pleasure to wear and really is worth paying the extra money that it costs to ship/import tax. Thank you Fox Creek Leather for a lovely waist coat that I really like wearing, I now have my eyes on ordering a jacket from you, as soon as my wedding bill has been paid for…..